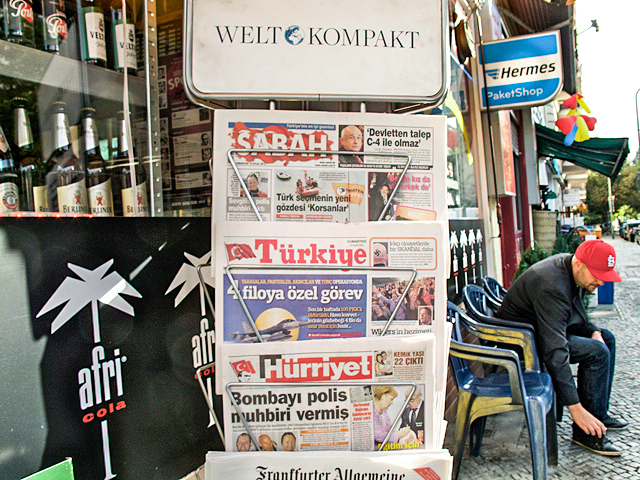 Turkish police raids on media outlets are incompatible with media freedom and run counter to European values, the European Union said in an unusually strongly worded statement yesterday (15 December). “The police raids and arrests of a number of journalists and media representatives in Turkey today are incompatible with the freedom of media, which is a core principle of democracy,” EU foreign policy chief Federica Mogherini and Enlargement Commissioner Johannes Hahn said in the joint statement. “This operation goes against the European values and standards Turkey aspires to be part of,” they said. Turkish police raided media outlets close to a US-based Muslim cleric on Sunday and detained 24 people including top executives and ex-police chiefs in operations against what President Recep Tayyip Erdo?an calls a terrorist network conspiring to topple him. The raids on Zaman and Samanyolu television marked an escalation of Erdo?an’s battle with ex-ally Fetullah Gülen, with whom he has been in open conflict since a graft investigation targeting Erdo?an’s inner circle emerged a year ago. Several hundred people chanted “The free press cannot be silenced” and “Turkey is proud of you”. The European Union was quick to condemn the raids, saying in an unusually strongly worded statement they were incompatible with media freedom and ran counter to European values. The US State Department called “as Turkey’s friend and ally” on Turkish authorities to protect media freedom and other democratic values. Istanbul Chief Prosecutor Hadi Salihoglu said in a statement arrest warrants had been issued for 31 people on charges of “establishing a terrorist group”, forgery and slander. In raids across EU-candidate Turkey, 24 people were detained, including two former police chiefs, state broadcaster TRT Haber said. Also detained were Samanyolu’s chairman and the staff of two Samanyolu drama series, one about an anti-terrorism squad and the other set in a southeast hit by Kurdish rebellion. Erdo?an, whose AK Party was elected in 2002, introduced many democratic reforms in his first years in power and curbed army involvement in politics. NATO allies often cited Turkey as an example of a successful Muslim democracy, but more recently critics have accused Erdo?an of intolerance of dissent and, increasingly, a divisive reversion to Islamist roots. Alluding to Gülen’s ‘Hizmet’ (service) movement and the raids, Prime Minister Ahmet Davutoglu told a meeting of his ruling AK Party in southeast Turkey those who “infiltrate state institutions” should expect to give account for their actions. “Those who prepare dossiers against the prime minister of a government … who came to power with the national will shall give account before the people and history,” he said, attacking those who “declared war on the government in the guise of ‘service'”. Main opposition CHP leader Kemal K?l?çdaro?lu told reporters: “This is a coup government. A coup is being carried out against democracy”.Erdo?an accuses Gülen of establishing a parallel structure in the state through his supporters in the judiciary, police and other institutions, while wielding influence through the media. The cleric, living in self-imposed exile in Pennsylvania since 1999, denies any ambition to overthrow Erdo?an. Erdo?an drew on Gülen’s influence among police and judiciary in his first years of power to help tame an army that had toppled four governments since 1960, including Turkey’s first Islamist-led cabinet. That relationship has dramatically soured. Erdo?an, who consolidated his power further in moving from the prime minister’s office to the presidency in August, has described “Gülenists” in the past as terrorists and traitors. The EU opened accession talks with Turkey in October 2005, but a number of stumbling blocks are holding up Ankara's progress, in particular concerning Turkey's relations with Cyprus, human and minority rights and freedom of expression. ?Recep Tayyip Erdo?an, in his former capacity of Prime Minister, has faced vigourous opposition due to his crackdown of media freedom and freedom of speech over his past years of leadership. In the summer of 2013, protesters occupied the Taksim Gezi Park for several weeks, in what developed into a movement demanding respect for democratic and secular values in the country. Is this statement the only sanction against Turkey? This isn’t the first time anti-terrorism legislation is used as a pretext for silencing media and arresting journalists. Next time don’t go to Turkey.